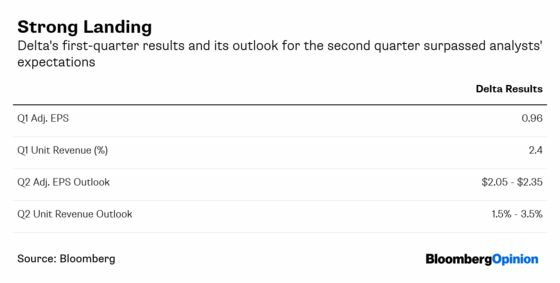 (Bloomberg Opinion) -- It’s good to be Delta Air Lines Inc. right now. The company reported first-quarter earnings on Wednesday that were even better than analysts had been expecting after it flagged earlier this month that results would be buoyed by strong business-travel demand and the extension of a credit-card partnership with American Express Co. Revenue for each seat flown a mile – a measure of pricing power – increased 2.4 percent in the first three months of the year, and should rise 1.5 percent to 3.5 percent in the current quarter, led by demand for more expensive business-cabin tickets. The strong showing gave Delta the confidence to raise its revenue growth outlook for the full year to as much as 7 percent, up from a previous range of 4 percent to 6 percent. Cowen & Co. analyst Helane Becker says the numbers put Delta well on the way toward reaching its goal of $6 to $7 in 2019 earnings per share. Among the four biggest U.S. airlines by market value, Delta is the only one that doesn’t operate any Boeing Co. 737 Max jets, so it’s been able to skirt the margin hit and pricing pinch caused by the global grounding of the plane following two fatal crashes in just five months. Its rosy forecast and subsequent stock pop stands in contrast to American Airlines Group Inc.’s warning on Tuesday that first-quarter results would be a disappointment after higher fuel prices ate into its margins, and as the government shutdown earlier this year and Max grounding limited its ability to raise fares. United Continental Holdings Inc. was forced to replace its Max fleet with jets that are larger than it needs. That’s costing the company money and it can’t sustain that dynamic forever, its president Scott Kirby said in a letter to employees on Tuesday, according to Reuters. Both crashes of the Max have been linked in part to flight-control software that was added to the updated 737 model to guard against a loss of lift. Boeing is still working on a fix for that system and last week curtailed production of the Max in an acknowledgment that it will be a while before the plane can return to service. American has removed the plane from its schedule through June 5, and that’s involved canceling about 90 flights a day, or 1,620 through the first quarter. Delta CEO Ed Bastian told CNBC Wednesday that he has “ultimate confidence” that Boeing will figure out a software fix for the Max, which is a much easier thing to say when none of your own profit is on the line. 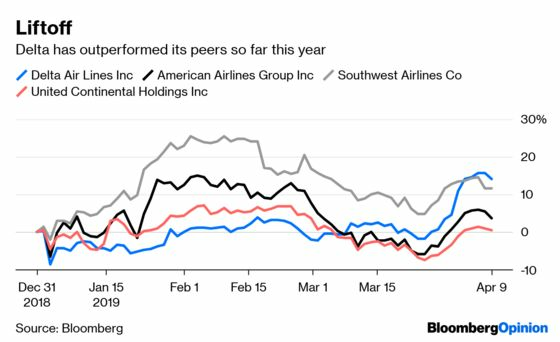 Southwest Airlines Co., which has the greatest exposure to the Max among the top U.S. carriers with 34 planes in its fleet, last month predicted a $150 million revenue hit in the first quarter from a combination of the grounding, a dispute with its mechanics union and weaker demand from leisure travelers. At the time, there was something of a sigh of relief among investors that the impact of the Max grounding wasn’t worse, but Southwest’s guidance update also came before Boeing dialed back production of the plane. In a recorded message to employees earlier this week, Southwest CEO Gary Kelly said the company was expecting the planes to be out of service through June 7, and that it was too soon to say how the reduction in production would affect the pace of Max deliveries over the next few years. In the short term, the capacity reductions from the grounding may not be such a bad thing as it may help airlines boost fares during off-peak periods where there’s arguably an oversupply, Savanthi Syth of Raymond James Financial Inc. wrote in a note earlier this week. But the odds are rising that the grounding could stretch into the peak summer travel months; to compensate for that, airlines may need to retrofit older planes or seek leasing alternatives. That assumes the softer leisure travel demand of late will reverse. Delta said Wednesday that it sees “relatively robust” leisure demand going into the second quarter, but its increasing focus on higher-priced business travel would also help shield it from consumer weakness. More than half of the company’s revenue now comes from premium products or non-ticket sources. Despite unfavorable currency swings, the government shutdown and capacity additions, Delta said Wednesday that it expects its unit revenue to remain more than 110 percent higher than the industry average. Obstacles are ahead for the airline industry, but Delta looks poised to fly around them.